After perhaps one of the most disappointing seasons from any NFL franchise in 2017, the Tampa Bay Buccaneers aren’t quite in need of hitting the ‘reset’ button, but rather fine-tuning the pieces in place and upgrading those positions who vastly underwhelmed last year. Their offseason has already kicked off with the releasing of embattled running back Doug Martin, which saved the team nearly $7 million in cap space and the release of Chris Baker after one tumultuous, failed season in Tampa. While 2017’s offseason was about building their offense around Jameis Winston by adding weapons for the former Heisman Trophy winner to target, 2018’s offseason should be about more than that. Head coach Dirk Koetter and general manager Jason Licht have the fourth-most cap space to work with so a splash signing to bolster one, or more, positions is a very viable thought to entertain. In a free agent class loaded at some positions and lacking in others, in all likelihood, the Bucs will look to the draft to address some of their needs, while they can answer and plug some glaring holes in their lineup come the new league year later this month. While his time in the league is dwindling, Grimes still possesses the skill set on the outside of a shutdown cornerback. He tied for the team lead in interceptions last season and allowed a passer rating of just 73.8 on 72 targets into his primary coverage. Despite his age at a position typically craving youth, that 73.8 passer rating into his coverage was the lowest he’s allowed since 2013, showing he is still more than capable of covering the league’s best receivers. Against a variable who’s-who of some of the league’s top receiving options (Julio Jones, Michael Thomas, Ted Ginn, Jordy Nelson, Davante Adams, Jarvis Landry, Larry Fitzgerald, Brandon Marshall), Grimes was targeted 19 times, allowed only 11 receptions for just 108 yards, no touchdowns and recorded four pass breakups. 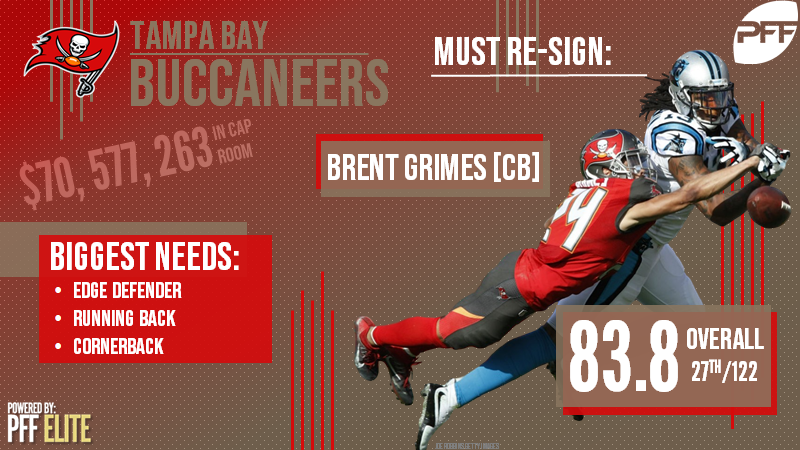 With Koetter’s desire to have Grimes back and his showcasing that he still has more than enough left in the tank to cover top receivers, bringing the 11-year veteran back could prove crucial at a position that will typically draw top dollar for other notable free agents. While drafting a replacement at the position to play opposite Vernon Hargreaves is another option, drafting a possible replacement and allowing him to learn under Grimes makes even more sense. The cream of the crop of defensive free agents this year, Lawrence will reportedly be seeking a multi-year contract worth upwards of $17 million a year. The Bucs are in a unique position where they would be one of a few teams to be able to afford Lawrence, if the Cowboys were not to place their franchise tag on him nor sign him to a multi-year deal themselves. Lawrence finished 2017 with the league’s highest pass-rush productivity among 4-3 defensive ends and wreaked havoc on opposing offenses to the tune of 79 total QB pressures. Gerald McCoy led all Bucs defenders with 47 pressures in 2017, from the interior of the defensive line. A move to sign Lawrence could free McCoy away from double-teams, chip blocks or any other way an offense has schemed around the All Pro defensive tackle in the past. Lawrence would immediately upgrade the Bucs pass-rush, something that has lacked for some time. Other than Robert Ayers and McCoy, no defender had more than 22 QB pressures a season ago, while Ayers himself finished with just 45 on 364 pass-rush attempts. This dream splash signing comes on the heels of the league’s other top edge-rushing option, Ezekiel Ansah, receiving the Lions’ franchise tag earlier this offseason, thus taking away one of the two top edge defenders, a position the Bucs could use more than just one of in 2018. Widely considered a position the Bucs will tend to in the 2018 NFL Draft, possibly even with their first pick, there are still viable options to pick up during free agency that could be valuable role players in 2018. McKinnon finished this past season with a very good 83.9 overall grade and was a threat with the ball in his hands, whether on carries or after the catch. He forced 30 missed tackles on the ground and another nine through the air and would prove more than capable to fulfill the void left by Doug Martin and Charles Sims and add much-needed depth to a team with only Peyton Barber and Jacquizz Rodgers currently on the roster. There are other positions of need for the Bucs, but free agency may not be the best place for them to go. Josh Sitton would be available to entertain to upgrade the interior of the offensive line and other areas of need such as interior defender and offensive tackle are lacking in players, there are plenty of cornerback options on the open market for the Bucs to think about. Fuller had a career year for the Bears in 2017, allowing just 51.3 percent of targeted passes to be caught and recording a total of 19 plays on the ball (two interceptions, 17 pass breakups). After injury took his 2016 season from him, Fuller picked the best time to have such a year, as he’ll likely garner a big contract, and again, the Bucs are in that unique position to spend some major capital on positions of need. Fuller would ideally play on the outside with with the re-signed Brent Grimes (see above), and allow third-year pro Vernon Hargreaves to play more of a slot cornerback position, where he had much more success in 2017. A once-heralded player, Jordan finally seemed to show why he was the third overall pick in the 2013 draft last season for the Seahawks. Playing within then-defensive coordinator Kris Richard’s 4-3 defense in Seattle, Jordan played just 135 snaps but racked up 12 pressures on just 65 pass-rushes. A player with his skill set to rush the passer, a familiarity with Bucs DC Mike Smith’s style of base defense and an dire need for multiple forces on the outside, Jordan would be worth at least an offer.